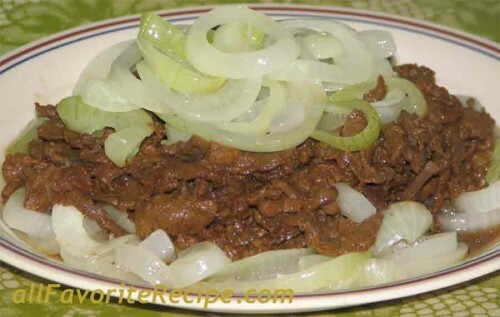 Beef Asado is probably one of the most popular Filipino beef recipes that Pinoy loves to cooked. They are commonly served in carenderia and big fastfood restaurant in the Philippines. This beef asado recipe has lots of variations and I’ve post two more ways in cooking them after the post. Kindly try and check them out. 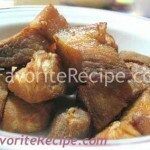 Pound slice beef and then marinate with soy sauce and calamansi. Let stand for an hour in the refrigerator. Place marinated beef in a pan over medium heat, add water and bring to a boil for 3 minutes. Drain, reserving the sauce. Heat oil in a pan over medium heat, fry onion rings until soft and translucent or just half done and then set aside. 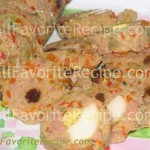 In the same pan, fry meat for about 3 to 5 minutes or until lightly brown. Pour in reserved sauce. Cover and let it simmer until meat is tender. Remove from heat. Arrange on a serving plate and top with fried onion rings. Serve hot. Have You Tried These Other Filipino Kitchen Recipes?